I was sent a free ButcherBox to share my opinion. There are also affiliate links within this post. As always, all opinions are my own. There’s nothing that gets me through the winter season like a bowl full of piping hot chili! And with the Super Bowl just a couple of weeks away, I’ve been craving my thick and hearty 30 minute chili recipe. But… I’m still in the midst of my Whole30, so no beans allowed. 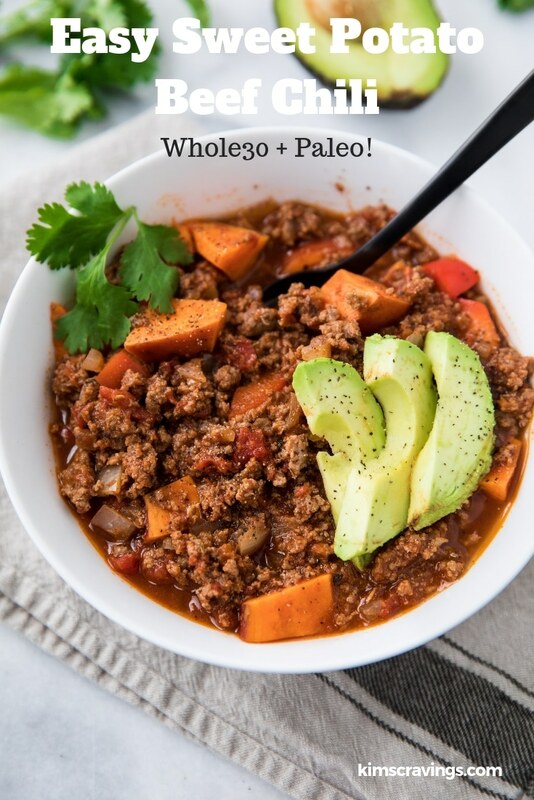 So I got to work, and adapted my favorite chili recipe to be Paleo + Whole30 approved! It wasn’t too hard to do, and the result is nothing short of fabulous. Brad even said it’s BETTER than the original when he tasted it. I personally think it had something to do with the delicious, high-quality grass-fed beef! 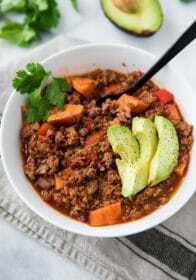 I got the wonderfully healthy, but oh so flavorful ground beef in this chili recipe from ButcherBox. ButcherBox is a meat distributor. They are neither a farm nor an online grocery store. Instead, they work with a group of family farms and cooperatives in order to bring grass-fed beef, heritage breed pork and organic chicken to your front door every month. Oh, and now they even offer Wild Alaskan Salmon! Look at ButcherBox like a farm liaison. 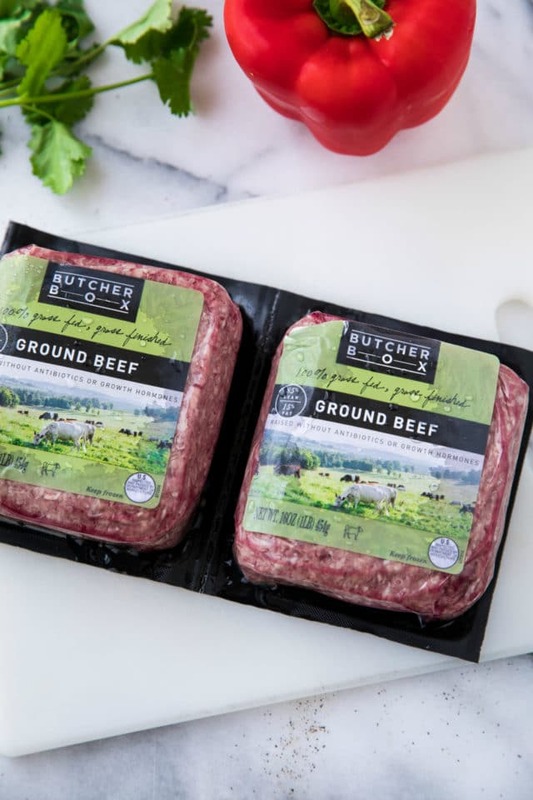 If you’re interesting in eating better quality meat but haven’t been able to find it at your grocery store or at a local farm, ButcherBox can provide it for you. ButcherBox is a monthly subscription service. You choose what package of meat you’d like, how often you want the box delivered (either every month or every other month) and then choose any add-ons if you’d like. An add-on would be a one-off item, like a package of uncured sugar-free bacon (Whole30 Approved + great quality) or 1 pound of boneless pork chops. The Custom Box is the only box where you get to choose exactly what goes in your box. As you register and/or login to change your order for the month, you can pick whether you want ground pork or ground beef or a whole chicken or salmon and so on. 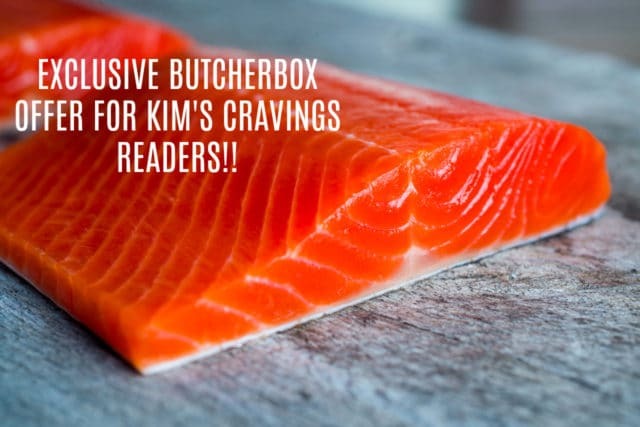 ButcherBox currently offers – beef, chicken, pork and now salmon – with the goal of bringing you the very best. The quality of the meat is pretty impressive, if I say so myself! The breeds of pork that ButcherBox sources have been specifically chosen for their rich color and marbled texture. There is no tail docking and the animals are either on pasture, or raised in open barns with bedding and space to engage in natural behaviors, as if they were outside. 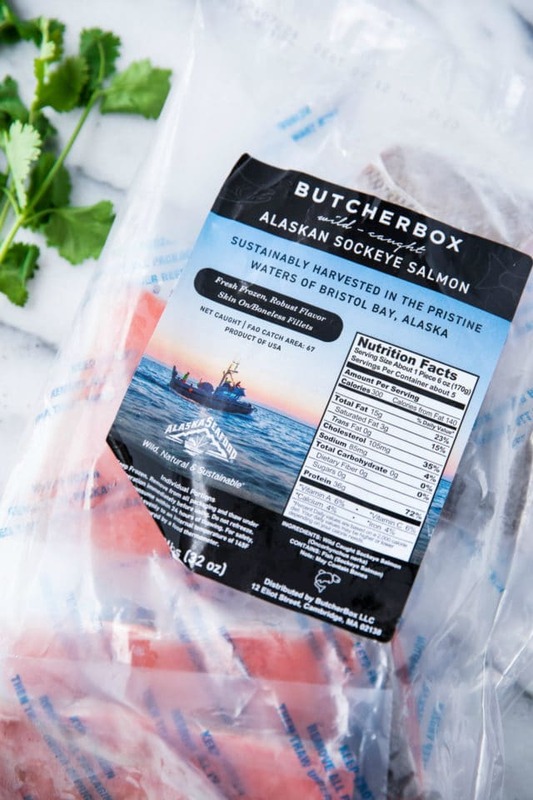 ButcherBox has partnered with fishermen who uphold strict fishing and handling practices to guarantee an unprecedented level of quality and sustainability. And as it is with all of ButcherBox products, the salmon contains no artificial coloring, no additives, no hormones, and no antibiotics ever. HOW MUCH DOES BUTCHERBOX COST? We all care about saving money, but if you’re familiar with shopping for high-quality meat you know it can be pricey. To me, it’s worth the price to feed my family meat that is not injected with any hormones or antibiotics. Right now ButcherBox is giving everyone who joins through this specific link 2 pounds of Free Wild Alaskan Sockeye Salmon in your first box! This is a limited time offer and only good through January 2019! That means TWO POUNDS of the highest quality, best tasting salmon you can find, FOR FREE, when you sign up with this link! Wild Alaskan Sockeye Salmon is not cheap and can be hard to find. I don’t know about you, but I don’t pass up free meat! Ha! If you’re not much of a salmon fan, you can use this link to sign up for ButcherBox and get $15 off your first order and FREE bacon! Now then, let’s cook up a delicious pot of chili! This recipe is super easy. Start by browning the ground beef in a large pot. While the ground beef is browning, I personally like to zap my chopped sweet potato in the microwave for a couple of minutes to get it slightly soft. If you don’t want to do this, you can simply let the chili simmer longer. Add in chopped onion and garlic. Once the ground beef is browned and the onion is soft, add in all other ingredients and simmer for 30-40 minutes. Sometimes sugar can be hiding in store-bought spice mixes. I typically buy all of my spices from Thrive Market and I can trust they are all organic and Whole30 compliant, without added sugar. 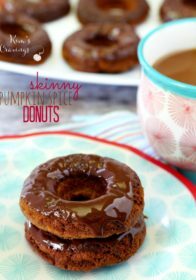 This recipe can easily be made in the slow cooker, making it easy for you to throw together in the morning and have it calling your name when you get home at night. Instead of simmering the chili on the stove, you can brown the ground beef, drain off the fat and place it into the slow cooker. Add the other ingredients and let it simmer on low all day (6-8 hours on high for 4-5 hours). I’ve used both ground beef and ground turkey in this Whole30 chili. You can even use ground chicken if you’d like. Each meat will change the flavor of the soup so pick whichever you like best. I top my chili with avocado slices, this avocado cilantro lime dip and fresh cilantro. 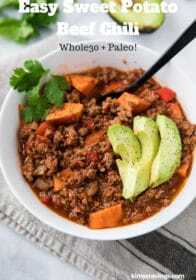 When I’m not doing a Whole30 I love to enjoy this chili with a handful of grain-free Siete tortilla chips from Thrive Market. 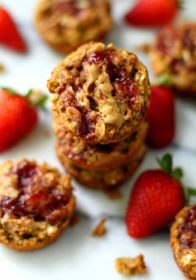 If you’re not limiting grains, may I suggest these low calorie Mexican cornbread muffins? They’re simply amazing with a bowl of hearty chili or soup. 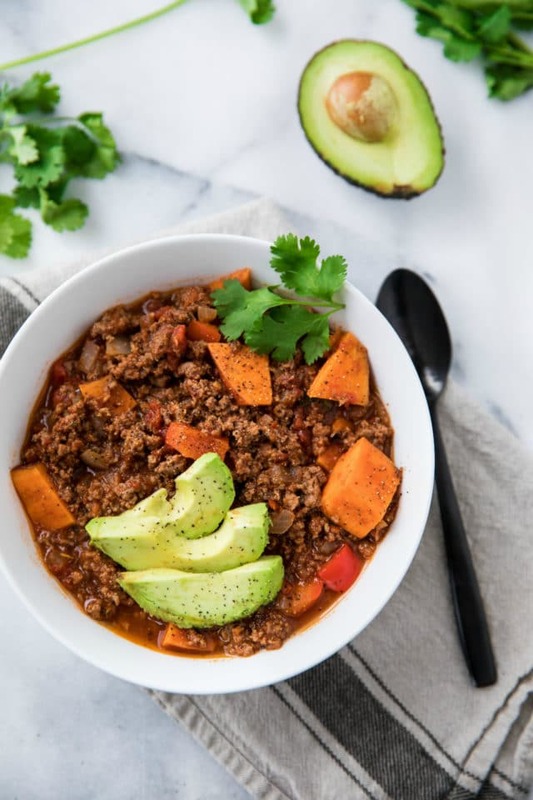 This Easy Sweet Potato Beef Chili is a bean-free, Whole30-approved take on my 30 minute chili recipe! 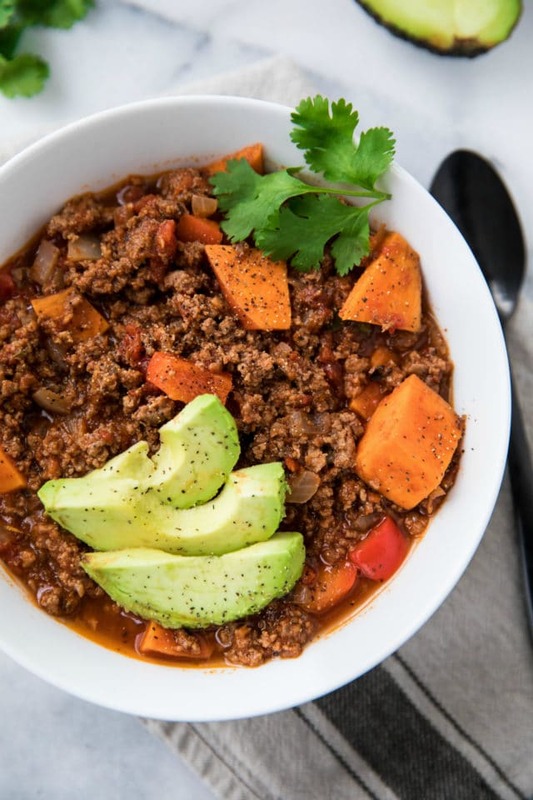 It's hearty, flavorful chili made with sweet potato, ground beef, bell pepper and a tasty blend of spices. In a large pot heat olive oil. Cook onion, beef, and garlic until fully cooked, about 7-10 minutes. Drain the fat and add all other ingredients. 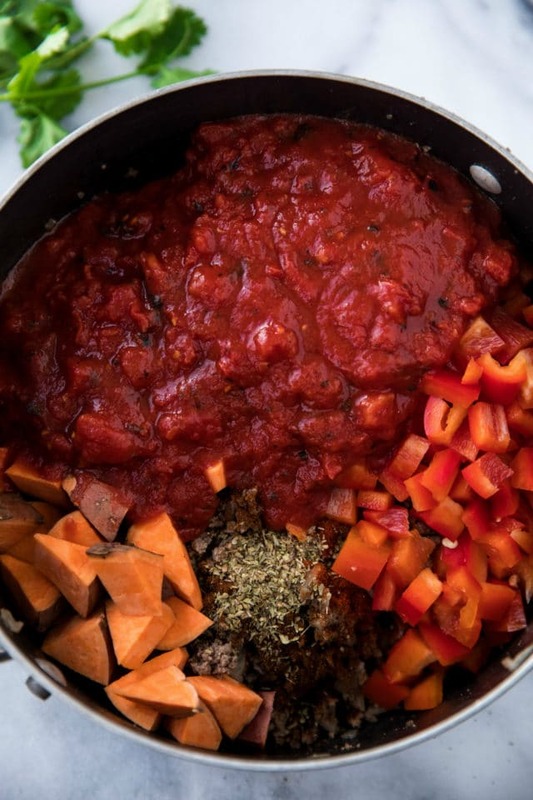 Bring the chili to a boil, then simmer for 30-40 minutes and until sweet potatoes are of desired softness. 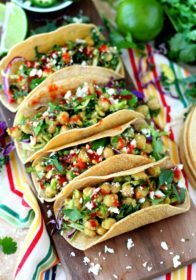 Enjoy topped with avocado, guacamole, and/or cilantro. *If doing the Whole30, watch your spice labels. Many spices are not compliant. **Consider zapping your chopped sweet potato in the microwave for a couple of minutes to soften slightly. This will decrease the cooking time of the chili. ***For a thinner chili, add water or broth until you achieve desired consistency. So smart to offer a Whole 30 adaptation to a classic. Helps to stay on track while not missing out on any favorites. Looks fantastic! You just can’t beat a bowl of homemade chili this time of year, and this recipe is my new favorite! 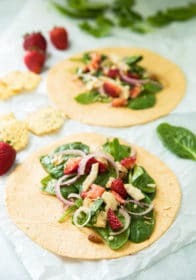 This looks absolutely mouth watering I love easy meals like this one and would be trying this soon! this chili looks awesome. And i am intrigued by this butcher box. It’s def something I would think about trying! 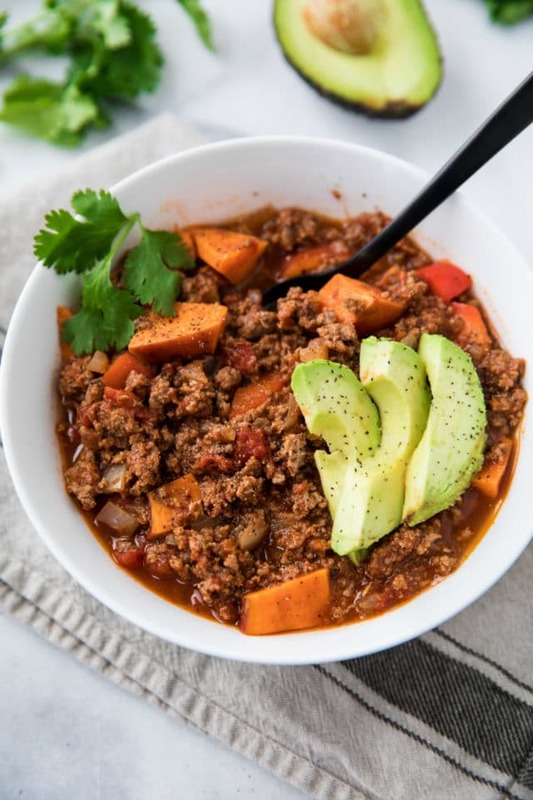 I make meat-free sweet potato chili but I now have some ground beef on hand so I might give this a go! 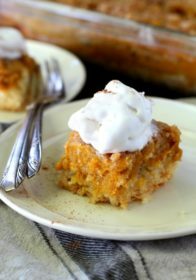 This looks delicious with the sweet potato. Definitely a recipe to try soon! This chili recipe looks like it’s filled with flavor! 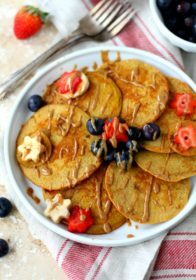 It also seems like an easy recipe to make too so I’m definitely giving this a try soon, thank you!